The Wonderful Adventures of Wandering Willy & Wendy children’s book series introduces K-5 students to the values of cross-cultural learning. Join the adventures as Willy and Wendy travel the world, discover new cultures, taste different food, make new friends, and learn how to become better global citizens. Order the first book of the series, Willy Visits Japan, for your students today! — Mike McKenzie, President/CEO, Vision of Flight, Inc. The What’s in Wandering Willy & Wendy’s Suitcase? 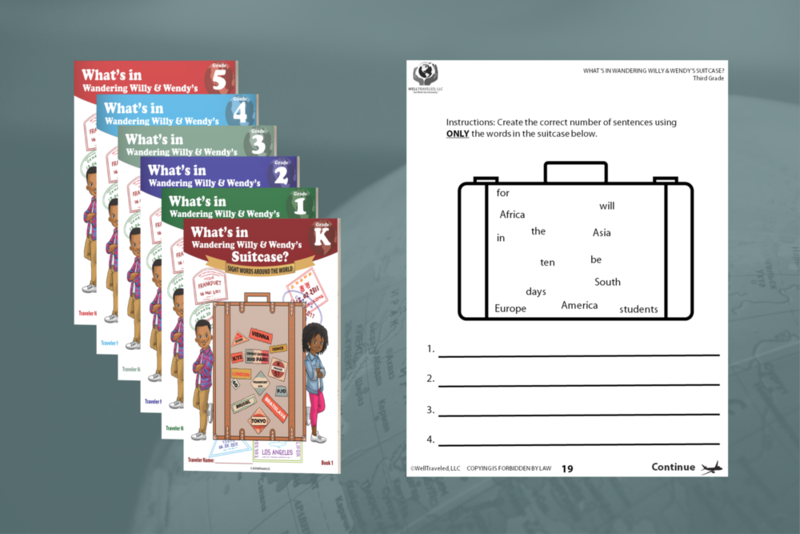 workbooks expose K-5 students to the world of travel while increasing student familiarity with grade-level appropriate sight words. These workbooks are an excellent way to facilitate student engagement/assist in improving literacy in class and at home. All workbooks reinforce College & Career Readiness Standards in the areas of Phonic and Word Recognition and Vocabulary Acquisition and Use. Our Passport Activity Workbook complements The Wonderful Adventures of Wandering Willy & Wendy children’s book series. It includes engaging activities about geography, languages, famous tourist attractions from around and more for K-5 students.